Sometimes you start a blog writing about one thing, and then the focus of your blog shifts, and you discover you need to rebrand. 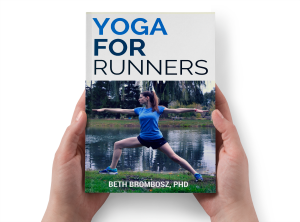 I started Running with the Sunrise as a running journal more than anything, but after getting my yoga teacher certification, I started to write about a lot more than running. That’s when I decided to start the process of switching over to Sublimely Fit. Lucky for me, I met some awesome ladies at BlogFest who have successfully (very successfully) rebranded, and they gave me some really awesome blog rebranding tips there. I was so excited when they agreed to be interviewed for this blog post, because they really do have some great insights! Tiffany from Thoroughly Thriving, formerly Running Hutch. Rebranding your blog? Read these tips from @lifenleggings @CoachHenness & @CoachDebbieRuns! How long ago did you rebrand? Heather: Life In Leggings launched early February 2015, just about seven months ago! Debbie: I rebranded in March of this year. Tiffany: I started the process in February (collecting quotes from web designers) and it finally wrapped up at the end of May. Why did you choose to rebrand? Heather: A few months after I launched Housewife Glamour, I didn’t like the name anymore. I went from documenting DIY projects and wedding planning to sharing healthy recipes and workouts. It just didn’t fit what I really loved to write about. When people asked what I did and I mentioned blogging, I never wanted to share the name. I didn’t feel confident that people would get it or take me seriously! That’s a horrible feeling, and not one you want to roll with when pitching yourself to potential sponsors and brands. I had also been wanting a new site design for years. I loved the look of it, but because it was so customized, I wasn’t able to create sub-pages, archive recent and old posts, or organize the site like I wanted to. After a post went live, I felt like it disappeared into cyber space and could never be accessed again. This is a huge disadvantage as a blogger, as you want to keep growing your work and building your online repertoire. Eventually, I became so discouraged that I decided to hire someone for a site redesign that also led to a rebranding with new logos. I figured why not do it all at once and make it one big reveal? Debbie: When I started my blog over six years ago, I had no idea what I was doing. It just sounded fun. I had to choose a name, so I chose Live from La Quinta, which is where I live. Over the years, as I found a direction and a focus, I felt that my name was holding me back. 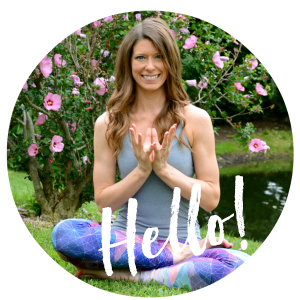 If you’re looking for a healthy living or running blog, you certainly wouldn’t know from the name that was what I wrote about. Tiffany: My blog began as a running journal during a time in my life when I was still trying to figure out what I wanted to do and be about. Over the course of 5+ years blogging, I had changed a lot and so had my blog. I had finally figured out what I am most passionate about and it was time that my blog reflected that clearly. I chose to rebrand because I believe I’ve settled on a theme/topic that is long term and can encompass all that I am about and want to write about. What do you wish you would have known before rebranding? Heather: Rebranding is a pain, but if what you currently blog under doesn’t fit your overall purpose or goals, it’s one hundred percent worth doing sooner than later. [Beth’s comment: I couldn’t agree more! I thought about rebranding a year ago and someone talked me out of it. I really regret that decision. Your blog will just keep growing, so the sooner the better!] Your blog title should reflect your content. Life In Leggings (although, I will admit that it could still be taken the wrong way) gives off a heathy living annotation, but it still leaves room for me to share tidbits about my everyday life and whereabouts. I can’t tell you how many times I have introduced myself as Heather from Housewife Glamour, then immediately felt like I had to explain my blog title. That almost always followed up with “but it’s changing…”, and I went into unnecessary stories that the person asking probably had zero interest in hearing about. I’d say this went on for about two years. It’s not the best look, y’all. I wish I would have realized that rebranding is not as scary as you might think. Thanks to hiring a professional (whose information is below), and the support of friends and blends (blog friends), it really wasn’t as hard as I thought it would be. Annoying? Yes. But totally doable. Debbie: I reserarched pretty well, so I knew that my numbers would drop, which was probably the only downside to rebranding. Even though everything was redirected to my new URL, my numbers went down by about 50% for a time. The good thing is, now the numbers not only recovered, they’ve almost doubled! Tiffany: I’m used to working with designers on projects as I’ve had a background in marketing and doing some design work myself. I can’t say there is anything that took me by surprise during the process. I think one thing people need to be ready to do, though, is to say “No, this isn’t working for me. How about we try X, Y or Z?” In other words, if something (a design element or font) doesn’t fit you, don’t be afraid to say so, but offer ideas as to what might work better. Rebranding a blog might take more than two or three drafts to get it right. When switching your blog to your new domain, did you take care of the transfer, or did you have someone else do it for you? Heather: Transferring my work from one blog to a completely new one was very intimidating for me. I probably could have researched exactly how to do it, but I didn’t want to make a mistake and somehow erase everything I’ve worked so hard to put out there. After polling a group of blogging buddies, I contacted a couple of companies to see if I would be able to hire one to help me merge my blogs the right way. Eventually, I found Jeff from Murnan Creative and can’t recommend him enough! He knew exactly what to do and made the process as easy on me as it could possibly be. Debbie: I did everything but the actual transfer. I’m usually a do-it-yourself-er, but after reading how to do it there just seemed too much for me to handle. I hired Rita Barry from Blog Genie to do the transfer and the redirect. Tiffany: I’ve done the transfer before in the past, but this time I made sure my designer could handle that for me. Reason being, my time and efforts are truly better spent creating content for my blog, engaging readers on social media, and coaching. Blog time is a limited resource and at this point, I’m better served paying someone to cleanly take care of those details so I can do the things that only I can do – write my blog. What problems came up during rebranding that you didn’t foresee? Heather: Google Analytics was a tricky one. As a blogger who works with brands and publishing networks, reporting site traffic and stats is a big factor in sponsored work. For the first several months, I was getting active hits on both housewifeglamour.com and lifeinleggings.com every day. I was confused on why my old blog was receiving hits since everything automatically redirected to the new one, and I didn’t know how to fix it. I reached out to both Jeff (mentioned above) and my blog friend, Katy Widrick for help. She was a rockstar and took me through the process of deactivating unnecessary plug-ins that were essentially counting all of my hits twice. By the way, I would also recommend hiring Katy for anything having to do with the business of blogging. She actually understands (and loves) SEO, helping bloggers build marketable media kits, and much more! Debbie: The only problem that I had was probably one of my own stupidity (or ignorance). Because I have the redirect, I have to continue to host my old Live from La Quinta site. However, I noticed that because everything, including photographs, were now doubled, it was taking a huge amount of space on my server. I asked Rita if it was okay to delete the photos on my old site and she said yes. I’m not sure what I did, but I lost a lot of pictures somewhere along the way. Most survived, but I still find old posts that don’t have the photos anymore. It’s a process, but I’m working on cleaning it up. Tiffany: I chose to work with an affordable designer who does this on the side. Turnaround time on changes took longer as he does have a day job. I knew that going in, but we still finished over a month behind our target date. There are also design styles and web “tricks” we love and see on other blogs, but it turns out they aren’t so easy duplicate on a wordpress.org platform. A few things I requested weren’t able to done without completely building a site from scratch (instead of using an existing, customizable theme). But hey, you don’t know until you try or ask, right? I had to adjust my vision for the blog and compromise on certain elements to do something that was affordable. How did you handle switching your social media account names? Heather: Once I decided on a new blog name, I was on the hunt to reserve new blog handles for all of my social media channels. Unfortunately, lifeinleggings was already taken on both twitter and Instagram, but they weren’t taken by bloggers. Discouraged, but determined to still run with my new blog name, I came up with the closest names to reflect the title that I could. It really bummed me out that I couldn’t match all of my handles exactly to my blog title, but I eventually got over it. What can you do, right? I finally settled on using “lifenleggings”, but I didn’t want to change everything over until the new site was revealed. I wanted to ensure they would still be available for me (and only me) to use, so I signed up for the new handles under an alternative email to make sure they would be free when I needed them. I deleted my accounts with the new handles the morning the new site went live to release them. I then signed into my (old) accounts and changed the usernames/handles. Facebook, however, took several weeks to change. I had to apply for a new page title, and you can only change it once. They asked me if I was “sure” about thirty times! That was a bit of a headache, but it eventually worked out. Every social media platform is different, and the only one I still can’t figure out is YouTube. I now have three different emails attached to different YouTube accounts. Any suggestions on how to keep my videos and change my URL/username? Let Heather know in the comments and I’ll forward that info on to her! Debbie: That was actually pretty easy. Twitter, Instagram, and Pinterest are very simple. They have guidelines on their sites, but basically you can just change your account name and all of your followers come right along with you. Everything automatically updates to the new name. Facebook was more involved. You have to request a change of name, provide them with something to prove that you’ve changed your name (they accepted a picture of my new logo), and then they have to inform your followers. The process took about two weeks for me, but I’ve heard other say it took longer. My Google+ was already in my own (real) name, and, as far as I know, you can’t change your You Tube name. Tiffany: This is probably the easiest part of the puzzle, as most social accounts allow you to edit your handles. My Facebook page was, by far, the most time consuming. Which is ironic considering it is the least helpful platform for me. The biggest thing about switching handles is making a list of EVERYWHERE you’ve got a link to your socials. That could be guest posts on other blogger’s sites, a profile on an ambassador page for a brand you’re connected with, forums, campaign sites like Tapinfluence, Tomoson, etc. Having that list handy to update in one fell swoop is important. The other piece of advice on switching social handles: ADVERTISE that you’re doing it. I think I lost a good bit of followers because all of the sudden, “Coach Henness” was showing up their feed and they were like…wait…who is that? Giving everyone a heads up that you’re switching names BEFORE you do it can be helpful. Did you have any rebranding resources that you found helpful during the process? Heather: Honestly, I didn’t do much besides talk to other bloggers who have rebranded. Erin was very helpful, and was also who recommended I hire Jeff. The biggest piece of advice I got from others was to go with your gut! If you feel like the brand you currently work under is holding you back from your true voice, rebrand. You may experience a hit in pageviews at first, but eventually, you’ll get back and grow even more! Debbie: I followed along with some other bloggers who rebranded, but that was about it. I used some WordPress resources to figure out how to transfer, which is what helped me to decide to get help. But no particular blog or article about it. I believe I also asked a couple questions or read other’s questions, on the FitFluential and other Facebook group’s blogger support pages. Tiffany: Not really. The most important thing to do is to probably search and read articles that talk about design and branding to begin with. They’ll force you to answer questions like, “What is your story?”, “Who is your target reader?” and “What is the emotion/feeling you want readers to have when they first land on your page?” This helps you to get the ball rolling in terms of narrowing down what you want, what is YOU, and what is not you. Did you create any rebranding resources that you’d like to share? Debbie: As hard as it is to believe, I didn’t blog about it (except about the fact that I had changed, which is here: Say Goodbye to Live From La Quinta. Hello to Coach Debbie Runs). Because I did it in pieces (I changed my log, blog name, and design about a month before the actual URL name), I mentioned it here too: A DIY Blogger: Welcome to Coach Debbie Runs. Any final tips about rebranding that you’d like to share? 1) If you’re thinking of rebranding, don’t wait to do it years down the road. I knew I wanted to rebrand the first year I launched my old blog! Looking back, I should have just bitten the bullet then. I was afraid to go back on all of the branding I did, but if I had just gone with my instincts and changed the name when I originally wanted to, I would have saved myself a lot of trouble. 2) You’ll probably want to hire someone to help you. Having someone assure me nothing I was doing would erase my work into the Black Hole of the Internet was the best feeling. Had I have ventured out to rebrand on my own, it probably would have taken twice as long. Professionals have done this many times, and tasks that would have taken me hours of researching online to fix happened with a simple message request from me to him. It was worth every penny! My biggest fear in rebranding was losing all of my readers. Would they stick around to follow me on the new platform or think the change is inconvenient and unnecessary? I already knew I was going to rebrand, but I put a reader survey out there to gather their thoughts on it. More than half agreed that I should rebrand, since what I write about wasn’t clear from the title. Before I rebranded, I announced it would be happening and even counted down to the new site launch date. I kicked off the new site with a Giveaway Week to get my readers excited, and I raffled off prizes to thank them for sticking through it all. They haven’t gone anywhere, and I have received a lot of great feedback! Debbie: One of the most challenging and time-consuming things is to update everything after you make the change. Any publishing networks, ad networks, partnerships, etc. all need your updated information as soon as possible, not only about your actual blog, but all your social media accounts as well. Some companies require a request to change that may take a few days (Collective Bias for one). Even a couple months after my rebrand I’d come across an account I forgot to update. I’d suggest to make a list before the rebrand of all accounts that will need to be updated, then get it done as soon as possible. Don’t forget Google Analytics. I had updated my GA account, but, since I had a new UA number, a couple of my marketing accounts weren’t getting my correct numbers. So make sure that any company that draws your numbers directly from Google Analytics gets updated. For me this includes Tap Influence, Clever Girls, and a few others. Also, update any RRS or syndication feeds, including Feedly and Bloglovin’ (which also took an email to accomplish). With Feedburner, my link remained the same, I just needed to update my account. Tiffany: Unless you have money to burn, don’t pay someone to help you rebrand your blog simply because you’re bored. If you’ve changed since you first started blogging, your old blog probably doesn’t fit you anymore. It’s one thing to recognize what doesn’t fit. It’s another thing to know what WILL fit and then be able to explain that to someone and pay them to make it happen. So take the time to think about what will fit you. What will last with you over the next few life stages. A million thanks to Tiffany, Debbie, and Heather for taking the time to share their blog rebranding tips. Please pop over to their blogs and give them some love! Do you have any questions about rebranding that you’d like to have answered? 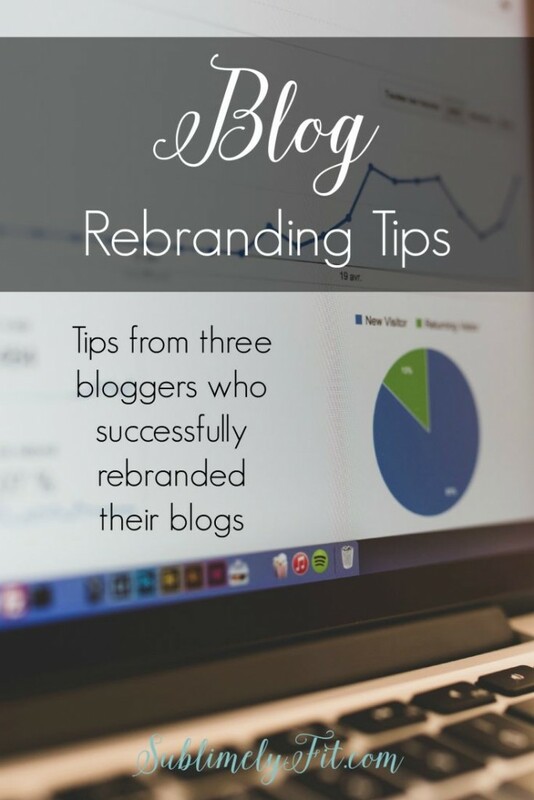 Do you have any blog rebranding tips to share? Any interest in a rebranding chat, perhaps on Periscope or Google Hangouts? This post will be a great resource for anyone who is thinking about rebranding. I wish I’d read something like this before my change. I think so, too. Thank you so much, Debbie, for providing all sorts of awesome advice! I really appreciate it, and I’m sure the folks thinking of rebranding who read this post will appreciate it, too! Yes, that will be a LOT easier. That’s why I paid Jeff to handle all of the URL stuff–didn’t want to deal with it myself! Wow – talk about AWESOME advice! I’m looking to rebrand too, but so hesitant… It is a huge undertaking! It absolutely is, Liz! I think what Tiffany said is absolutely true–it’s not worth it to rebrand if you’re just bored with what you’re doing, but if you really are going in a different direction it’s something to consider. And if you have the money, hiring someone to help makes it all so much easier! Glad you enjoyed it, Ashley! I’m just so grateful to Heather, Tiffany, and Debbie for providing the great information. I love this! Thank you for sharing. I recently have decided to merge my multiple blogs from 15 years of time into one and it’s been much more of a process than I expected! This was a great help! You are so welcome, Kristin! I’m glad you got as much out of the interviews with these amazing ladies as I did. It really does help to hear what others have done! This is really interesting because after much thought I decided to NOT rebrand and just build a site around the current name. I’m still not sure it was the right decision, but it was mine! haha! I love what you did though! Thanks, Julie! I struggled with rebranding for a long time. Last year at this time I thought about doing a rebrand and didn’t, and I wish I’d gone through with it, at least after a month or two of really thinking about it. For me, it really was about my blog’s name representing what I blogged about. It’s a really tough choice to make! Great read! Even for someone, like me, not planning on rebranding, I still picked up a lot of useful tips! So glad you found it helpful, Brie! Your absolutely right–these ladies give some awesome advice!